Alia started pilates in 2006 and immediately developed a thirst to understand it all. Coming from a desk-based career as a document designer her transition to teaching pilates started in 2010 when she qualified as a mat teacher with Body Arts and Science International, and as an equipment teacher in 2012. 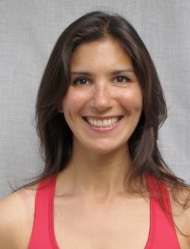 With a background in performance dancing and interests in mind-body and movement therapies such as Alexander technique and Feldenkrais method, her transition to teaching a movement therapy has been a natural progression. She has experienced both the subtle and extremely rehabilitative benefits of pilates following knee surgery to reconstruct her ACL after a skiing accident. Her biggest learning from these techniques, and the most valuable benefit she feels pilates has to offer her clients, is a heightened awareness of habitual (unaware) use of the body, and mind. Taking what we learn in the studio into everyday life, from breathing to how we stand when we brush our teeth, can put the body on a path to pain-free living and is what motivates her to teach.